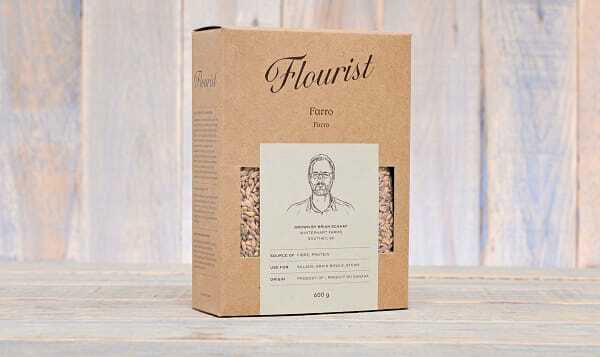 « back | All Categories » Grocery » Rice, Beans & Grains » Farro (Emmer) grown in Southey, SK. Farro, also called Emmer, is an ancient wheat strain similar to the very first wheat cultivated by ancient Mediterranean civilizations. Farro dominated the fields of the Near East, northern Africa and Europe until early farmers of Ancient Rome crossed wheat species to produce modern strains like durum. Chefs and home cooks around the world are rediscovering Farro as a hearty side dish, a protein replacement or a salad compliment. Farro is very high in protein, with strong, cohesive gluten. It makes beautiful pasta flour -- Italians have been making pasta with Farro for centuries. GRAIN brings you farm-direct dry goods with a story — stories of real people growing food. They source Canadian products exclusively, choosing only the best they can find, from farmers and processors they know. They bring a fresh approach to dry goods — one that engages, questions and encourages us all to reconsider the food on our tables and how it got there. By rejecting conventional practices of processing, storage and distribution, GRAIN is reframing the way we view otherwise commodified food sources. GRAIN presents a new way. Taste bread made with fresh-milled flour — or experience the satisfaction of cooking chickpeas from scratch. GRAIN is a connection between farmers and our food.